Dan Gibson’s research shed new light on the origins of Islam (in a book and a documentary). What does it mean? Noticing that the prayer directions (or qibla-s) of ancient mosques did not point to Mecca until after 725 (and we have even to wait 822 before seeing all the new mosques pointing towards Mecca), Dan Gibson put attention to mosques dating back to 725, many of which seem oriented towards ... Petra in Jordan. And Mecca? Before becoming the holy place of official Islam , Mecca is believed to have been the capital of the anti-caliph Al-Zubayr (660-692); but how could such a little and remote place – and as dry as a bone – have ever been his capital? Petra is a much better (and real) rear base for an opponent to the masters of Damascus Yazid and then ‘Abd Al-Malik! Unlike Dan Gibson, we don’t see Petra as birthplace of Islam (he locates there Ka‘ba, Zamzam, Bakka etc. without any topo-paleographic argument). The link of Petra with the primo-Islam only is Al-Zubayr. In their disarray after waiving Jerusalem as qibla and after ‘Ali’s murder, his supporters must have turned to his capital for praying. And that’s all! At the opposite our own research rigorously highlighted a Mount “Abu Qubays” in northern Syria (its summit bore a “sanctuary of Abraham” according to a Persian source): this name obviously was transferred to a mount at the edge of the Meccan basin. Moreover, just not far from there can be found mount Abu Ka‘ba –: its name is historically attested, it is not a speculation. And above all, the name of Muhammad ’s tribe, Quraysh, is that of northern Syrian place and river! And there are other clues more. 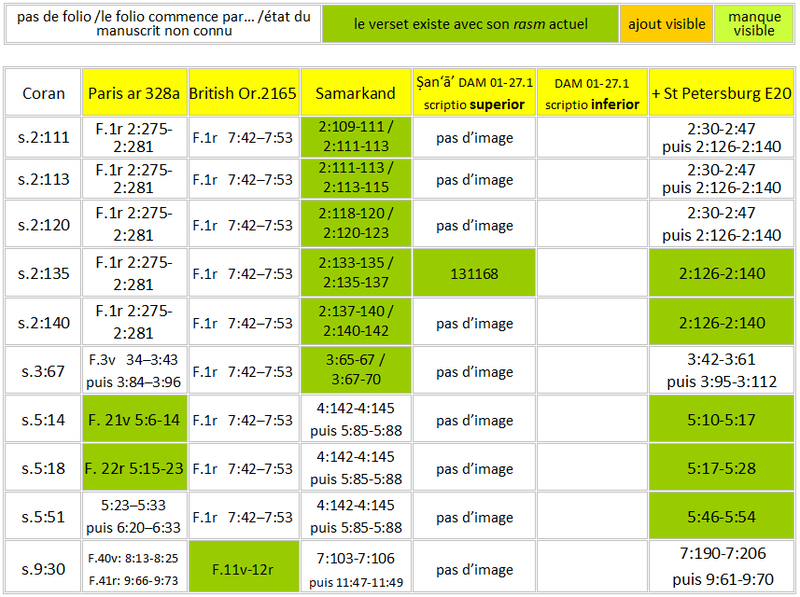 All these data clearly suggest that Mecca was founded later than 660 (as a place of pilgrimage); when precisely? No source ever mentions Makkah (in Arabia) before the 8th century, but thanks to Gibson’s work and to the historical knowledge about Al-Zubayr, we may place the foundation of Mecca after the defeat of Al-Zubayr (based in Petra) i.e. at the time of ‘Abd Al-Malik. Waiting for a 98 pages Summary. two volumes of the thesis Le messie et son prophète: one page presentation. bookreview of The New Oxford Review about: ''Le malentendu islamochrétien /The Islamic-Christian Misunderstanding''. The Metamorphosis of the Notion of Love of God and of Neighbor : An Interpretation of the Root hbb [to love] in the Koran or pdf. 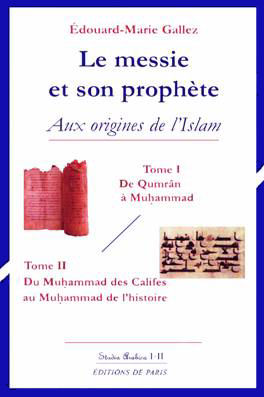 “People of the Book” and Nazarenes in the Koran: Who are the first, and on what grounds are the second included? or pdf. What Are We to Do With the Categorized Division in Meccan and Madinan Suras? or pdf. The Word “MUSLIM”: A Christian Term? or pdf. Does Jesus announce Muhammad in the Koran ? or pdf. “Sura”: arabic or aramaic term ? or pdf. Codicology and suspected verses or pdf. R. KERR: Did the Koran originate in Mecca or Medina? or pdf. Absence of Diacritics in the Koran: Rough Drafts of Preachers? or pdf. The two fundamental drifts from the Christian faith or pdf. Why does the Koran call Jesus ‘Îsâ instead of Yasû‘? or pdf. The Hidden Origins of Islam: Research + Dead-End? or pdf. 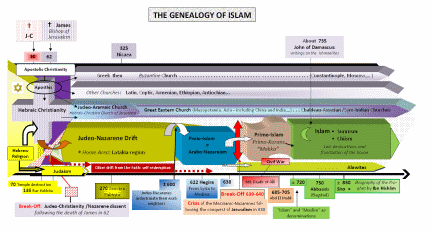 Sketch of the likely historical genealogy of Islam. JANSEN J.G. : Did the Sira of the Prophet borrow from ancient stories? or pdf. BATES M. L.: Roman and Early Muslim Coinage in North Africa or pdf. First Shâhadah-s: two or three parts? with or without Muhammad? or pdf.